Taking a few minutes each week to maintain and monitor aquarium conditions is the key to a healthy aquarium. The FRESHWATER MASTER TEST KIT tests the parameters that affect the health of freshwater fish: pH, High Range pH, Ammonia, Nitrite and Nitrate. 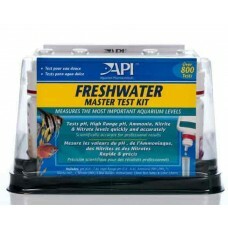 The FRESHWATER MASTER TEST KIT is highly accurate and economical, and includes a computer calibrated, laminated color card, 4 test tubes and holding tray. The FRESHWATER MASTER TEST KIT comes with a complete, step-by-step instruction booklet, including information on how to correct unsafe water conditions. What the user will need to test for to have a healthy thriving Marine tank.